T-Mobile is announcing two new subscription content packages for T-Mobile TV along with a new widget for finding out info on the latest shows, breaking news and tips and tricks. The first package is called Playground TV and is aimed at providing age-appropriate content for children. This package includes live channels and on-demand episodes from such shows as Curious George, Dora the Explorer and Sesame Street. The Urban Zone package includes content from BET, Rap Entertainment, R&B Jamz, and other similar stations. Both packages will cost $4.99 per month for standard definition or $5.99 per month for HD. Along with the new packages, T-Mobile is introducing a new T-Mobile TV widget that displays the latest information on new programming and breaking news. Americans’ love affair with television will not be thwarted, but it does change, especially as our busy schedules make watching favorite shows at home nearly impossible at times. Decades ago, VCRs brought a movie-rental revolution and now on-demand and DVRs don’t even require a trip to the store, granting viewers more TV-watching freedom. Today, with millions of hours of online content, and people constantly on the go, our love affair with TV adapts in order to endure. Television is becoming a nimble and accommodating partner. It doesn’t have to be watched on a TV set anymore – instead it now waits until called, in the comfort of a consumer’s pocket. T-Mobile has been seeing a consistent increase in subscribers to its free and paid T-Mobile TV services with the average user watching about 100 minutes per month. T-Mobile is keeping a keen eye on these trends, tailoring its offerings to match our customer’s needs and interests. Today, in fact, T-Mobile announces two new subscription content packages: Playground TV and the Urban Zone. In addition, we have a new widget for info about the latest shows, breaking news and tips & tricks. Kids’ programming is an important element for consumers. It represents 26% of viewership on T-Mobile TV, making it more popular than news and sports combined. Playground TV ($4.99/month for T-Mobile TV standard and T-Mobile TV for tablets, and $5.99/month for T-Mobile TV with Mobile HD) provides a large breadth of entertainment for parents that educates and entertains children up to 6 years old. The package includes live channels and on-demand episodes of popular programs, including Pocoyo, Curious George, Go Diego Go, Dora the Explorer, Cat in the Hat, Veggie Tales, Baby First TV, and Sesame Street. It’s not just toddlers that are beginning to get their TV on-the-move, so T-Mobile is further expanding its television offerings with the Urban Zone package on smartphones ($4.99/month for standard or $5.99/month for Mobile HD). Whether it’s classic TV, hip-hop videos or stand-up comedy, the new Urban Zone includes both live channels and video-on-demand content from BET, Classic Media (Fat Albert), Comedy Time (4Urban Standup), Deziak Entertainment (Salacious Streets), Rap Entertainment, Crackle TV, Hip Hop Music Video Channel and R&B Jamz Music Video Channel. The new content channels – in addition to the current availability of free channels on smartphones and tablets – are another way T-Mobile TV is expanding to meet the interests of our customers. Because TV isn’t going anywhere. It’s going everywhere. Wow, they’re actually charging more for HD. LOL!!! What is this world coming to? Sidenote: This app is kinda pointless seeing as how it’s sooo many other ways to watch TV on your phone now. And the big kicker is, when using such an app, Especially with HD, what do you think will happen to that Data? “Cap Reached” unless you’re in a crappy coverage area and then, you won’t be able to see anything but frame skips anyway so yeah, they can keep Tmobile TV. Agreed, but it’s just like AT&T Music, V CAST Music, V CAST Videos, and whatever Sprint has (I haven’t looked). You know some people somewhere will use it, even if there is something better at a better price. It’s just a way for the carriers to make more money off the ill-informed or the people who are too lazy or stubborn to look in the first place. Hey is wifi compatible with Tmobile TV ? If not my data will reach its limit probably in a week. I would use this app to watch the laker game while im in college waiting for my friends to come out of class to go home. Wish that if you bought this service any TV you watched would not count towards your cap. They should not count the data towards your cap when coming from TMO TV. They could easily do it but they won’t. It’s kind of pointless when you’d burn through your data so quick. streaming something decent is so hard on my phone unless I’m on wifi. I can’t see the content be worth anything either. i get 6 mbs per second and all i get is my video in slow motion …………i also get crappy video from tmobile when im using wifi. can someone tell me why i get crappy video on wifi. honestly .. does anyone even use TMO TV on their phones? i haven’t at all. not even once. $13/mo is grossly overpriced for what you get. 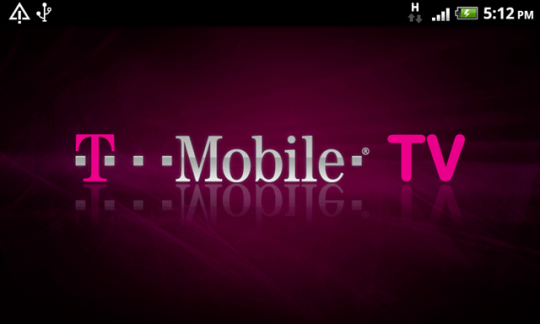 Hulu+, Netflix, or Amazon Prime all beat the offerings of TMO TV at a lower price. Because T-Mobile has a double interest in this product (branding and revenue) in addition to the value added services component, they should have more competitive pricing, not less. I agree. If anything they should have a lot more channels available at that price or maybe charge a annual fee instead… Say $29.99 to $49.99 a year. Even then would it still be worth it? The HD should be free considering it would use more bandwidth which you already are paying for and I highly doubt you could stream anything if you go over your data and you end up on edge. Heck if you used the service enough even the 10gb data plan using HD streaming wouldn’t last too long. Sorry Tmobile… your so called TV is way overpriced. Add some more premium cable worthy channels and then maybe I will take an interest. Just be a dumb pipe!!!! PLEASE! I do sometimes on my galaxy 2 to watch sports center when i am away on a busisness trip just to get some highlights for a mins. I have… not to mention some phones have HDMI so you could hook it up to your regular TV and use it as your source for cable. The only downside is unless you have the 10gb data plan or wifi it won’t work too well. True it may seem like a hassle but it could save you quite a bit of money so long as the price is right. I use my Amaze 4g as my sole form of Internet with my computer and its actually probably faster than the cable or dsl service where I live. not a bad idea, but still might be tough for them considering netflix is everywhere. I could be wrong in this assumption but don’t most of tmo’s android phones support netflix? Why bother expanding when they can’t seem to keep up to date witg the shows they already carry? I have TV service with T-Mobile and I thought about getting Playground TV on my Samsung behold phone for my little girl to watch but paying $4.99/mo to get eight channels kind of seemed like a rip off. So I looked into getting live TV on my phone with using DISH’s sling adapter. I do not have to pay any additional monthly charges and the sling adapter only cost $30. A DISH co-worker that sold me the sling adapter told me that I could watch live TV and DVR recordings on Smartphone’s, Tablets, Laptops, Blackberry’s, iPads and iPhones. My daughters able to watch Nick jr. and all the other kids networks that she does and home on my phone and that makes her so happy.